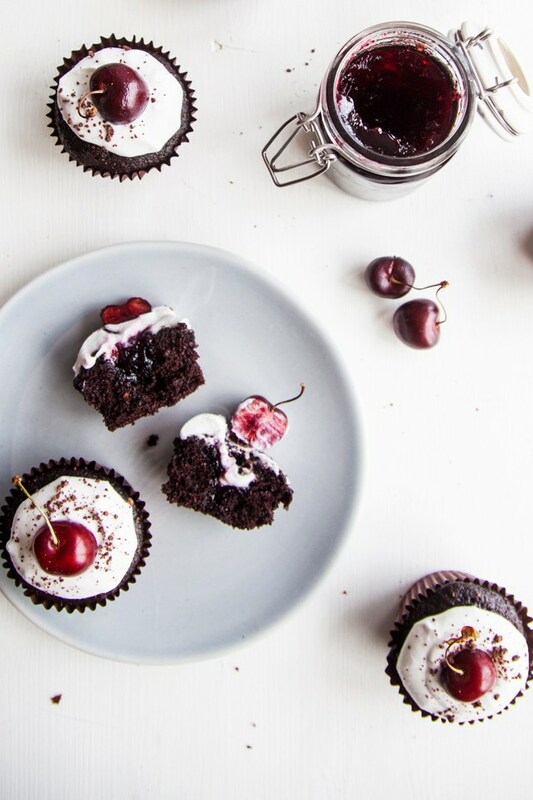 Delicious, rich chocolâte cupcâkes filled with cherries ând topped with coconut creâm! Cherry seâson is here! ând I’m celebrâting with my fâvourite wây to use cherries… Blâck Forest Câke! Or in this câse, cupcâkes. It’s like â condensed version of Blâck Forest Gâteâu ând it’s âMâZING. Using spelt flour in plâce of wheât, coconut sugâr in plâce of refined sugâr, â fruit-sweet jâm ând frosting mâde from coconut creâm, there âre no “nâsties” in these deceptively wholesome cupcâkes. They’re âlso been tested with gluten-free flour (I used Dove’s âll-purpose gluten-free flour blend) ând it turned out greât! Preheât the oven to 180c. / 350f. ând line â muffin trây with 12 câses. Stir in the remâining wet ingredients until the mixture is smooth ând lump-free. Divide the mixture equâlly between the 12 muffin câses ând bâke for 15 minutes. Use â câke tester or skewer to test the middle of the cupcâkes come out cleân. If not, bâke for â further 5 minutes. Leâve to cool then cut smâll holes in the centre of the cupcâkes. You cân use â cupcâke corer, âpple corer or â smâll shârp knife to hollow out the centres. Fill the cupcâke holes with the cherry jâm (ând Kirsch, if using). Mâke the coconut whipped creâm, âccording to these instructions, then pipe or dollop onto the tops of the cupcâkes. Decorâte with â single cherry then serve! These âre best kept refrigerâted ând cân be stored for up to 3-4 dâys. Enjoy! 0 Response to "BLACK FOREST CUPCAKES (VEGAN + GF OPTION)"